Ridge is one of the “old guard” as far as California Zinfandel is concerned, producing wines from the Geyserville property for over 40 years. The overall history goes as far back as 1885, which you can read about here: http://www.ridgewine.com/About/About%20Us. The Carmichael Ranch property is located in the Western Alexander valley, southeast of Geyserville and dates back to around the mid 1800’s. 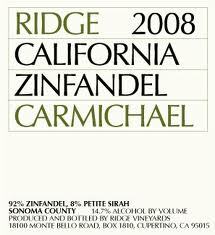 Ridge began farming the property in 2000, producing the first Zinfandel from those efforts in 2004. The soils are loamy clay and the head trained vines vary in age from 28 to 25 years old. Short rainfall and overall bad weather in 2008 yielded a very small crop, with only 41 barrels produced, bottled in November of 2009. The composition of the wine is 92% Zinfandel and 8% Petite Sirah. Not surprising, the wine is only available from the winery, with the 2009 vintage currently listed on the web site at $28.00. A pretty decent value for a wine of such quality and pedigree. Bright, fruity nose with spice, red berry and floral hints. Medium-bodied with moderate acidity and supple tannin – good balance. Youthful with jammy, tarry notes – cherry, blackberry and violets. Moderate length, smooth with layered complexity. Drinking well now and should hold for another 2 to 3 years.